Did anyone see this article from NPR over the weekend? “Whole Milk or Skim? Study links Fattier Milk to Slimmer Kids” It made me start thinking: Why do we drink milk anyway? Calcium? There are lots of ways to get calcium – kale, broccoli, almonds, sardines. I don’t think I have ever had a sardine. Hmm. Sounds salty. What about soy, almond or coconut milk? I’m thinking about these issues since our little guy just turned one today. (Happy B-Day Baby B!) The NPR article also made me think that we don’t know what we are talking about. As soon as one study proves one thing, the next moment another study says something different. And usually it’s the opposite. I can’t keep up. I like the last paragraph of the blog. Basically, we have much bigger things to worry about than skim verse whole milk, like soda for example! Although, I’m not sure I agree with government bans. That’s a little Big Brotherish. But really, you may be giving your kids skim milk but are they eating a bunch of other crap? I also don’t think the article means that giving kids skim milk is bad either. Just in case that is what you are already doing. It’s just another study proving…something which may be disproved next year. Categories: Baby Stuff, Read! | Tags: American Academy of Pediatrics, Calcium, Child, Health, milk, NPR, Skimmed milk, Specific Substances | Permalink. Our one year old attends a Montessori school, although he’s only in the infant room. Even in the infant room you can see the focus on order, simplicity, and independence. He seems happy and we like the teachers. I understand that each Montessori school can be different based on the Head of the School and how they decide to run things. I think it’s important to like the folks who are in charge since they can determine the learning atmosphere and choose the teachers. To learn more, I attended a few evening classes about expanding the Montessori philosophy into the home. I also read Montessori Play and Learn: A Parents Guide to Purposeful Play From Two to Six by Lesley Britton. Based on my limited study and neophyte knowledge on the subject, the main ideas as I see them are providing children with the opportunity to learn through play, promoting independence, and demonstrating through example a love of learning. In a Montessori classroom, children can move through curriculum at their own pace and they learn from older students. There are no rows of desks like most of us remember from school. Children choose their workspace and they may use a mat or table. Based on these ideas, I set up our baby (almost toddler room) with a colorful mat in the center of the floor to focus his attention. Even though he moves all over the room, I lay out new toys for him to play with on the mat. I spent ALOT of time de-cluttering the room. This took several attempts. Eventually I cleared out the closet and put all the toys in the closet. Then, I pick a few things and displayed them on the empty bookshelf in an organized and easy to access way. All the book were also put in the closet. The books that I put out stand upright so that the covers are showing. I use baskets to group toys together, which is very common in the classroom. I put pictures at floor level and put out pictures of family. There is also a plant in the room to bring nature into the home. Based on these ideas, I set up our baby (almost toddler room) with a colorful mat in the center of the floor to focus his attention. Even though he moves all over the room, I lay out new toys for him to play with on the mat. I spent ALOT of time de-cluttering the room. This took several attempts. Eventually I cleared out the closet and put all the toys in the closet. Then, I pick a few things and displayed them on the empty bookshelf in an organized and easy to access way. All the book were also put in the closet. The books that I put out stand upright so that the covers are showing. I use baskets to group toys together, which is very common in the classroom. I put pictures at floor level and put out pictures of family. There is also a plant in the room based on the idea of bringing nature into the room. Categories: Baby Stuff | Tags: Baby, Bullying, Child, clutter, Education, Learning, Methods and Theories, Montessori, Montessori education, organization, room, toys, YouTube | Permalink. Yum! I love ice cream and never thought there could be a healthy substitute. Behold! A clean eating recipe that was approved by Daddy and Baby. Cocao powder has iron, magnesium and zinc. Peanut butter has protein. And bananas have potassium, vitamin C, vitamin B-6, manganese and fiber. Can’t wait to try some other similar recipes like cherry almond ice cream or strawberry banana ice cream! Allow the bananas to sit out on the counter so they just begin to thaw (just barely). Put the bananas through the Yonana’s machine (or in a processor or Vitamix with a small splash of milk and blend till smooth). Stir in the peanut butter and cocoa powder. Mix well and serve. Categories: Homemade Goodies | Tags: Banana, Cocoa solids, cooking, Health, home, Ice cream, Peanut butter, Trans fat | Permalink. Dare I be controversial? Yes, I dare. Mention the word God and you may get many different reactions. For some, talking about God is very different from talking about church. It can be a touchy subject but I don’t think it has to be. Even if you don’t believe in God, you will probably still need to talk to your kids about God. I taught a Sunday School (kids) class the last two weekends at our church. It reminded me that talking about God to kids is a unique and wonderful challenge. It can also be frightening. It won’t be long before my almost-one-year old can talk about God. My time is short! I feel like I better get this figured out. Probably a good goal anyway, right? Do you remember what your parents said to you? I’m concerned about being too pushy or too apathetic. How do you make it a part of everyday conversation so that it isn’t uncomfortable (even if I feel uncomfortable)? I guess it’s like talking about morality, virtue or character. Well dang, that’s not easy either. I read that each child is brought to us to challenge us in exactly the way we need to be challenged in order to best promote growth. Thanks Baby B, I appreciate this learning opportunity! Categories: Baby Stuff | Tags: Bible, Christianity, Churches of God, Denominations, God, Jesu, Religion and Spirituality, Sunday school | Permalink. School Options: Public, Private, Homeschool? My husband and I have started having long conversations about school. Is public school or private school better? Should we move closer to the school we choose? Should we move to a new school district? Are social relationships as important or more important than the education provided at the school? Does the school not matter as long as the parent is involved in education? What about homeschooling? What about religious or Christian schools? Categories: Baby Stuff | Tags: Education, High school, Montessori, Montessori education, Private school, School district, State school, United States | Permalink. My heart goes out to moms having a tough, long winter. I’m right there with you! It seems like there has been one bug after another. As soon we get better, something else hits. We even had the dreaded flu. It wasn’t pretty. I’ve been sick more often than my one year old! He’s handling his first winter better than I am but that may have to do with leaving my job to start my own law practice. I feel less stress but it’s still a big change. I don’t usually handle change very well. The weather hasn’t made life any easier. It seems like most of the country has dealt with blizzards a good bit. Here in the Southeast we had alot of rainy, cold weather. So say with me: COME ON SPRING! If you are like me – mad at the weather and stomping around the house trying to single-handedly bring about spring as fast as possible, you may want to try some of these ideas. Buy some flowers for inside the house. Get your spring tools and yard as ready as much as you can. (I had the lawn aerated but you may be snowed in.) Try a new “homemade project.” I recently tried making my own sprouts, which is very easy and fun for kids. I’m also going to try baking some homemade bread. Start spring cleaning. (I LOVE cleaning out closets and getting rid of old clothes.) Plan next year’s spring vacation. Those are my tricks for beating cabin fever. I’m sure there are others. Let me know what you think and hang in there! Clean out one or two glass jars. Fill jars with about 1 inch seeds. I like alfalfa or chia seeds. Rinse the seeds and allow them to soak over night while covered with a towel. Place a covering over the top of the jar using a permeable material such as cheesecloth or nylon. I used nylon footies. 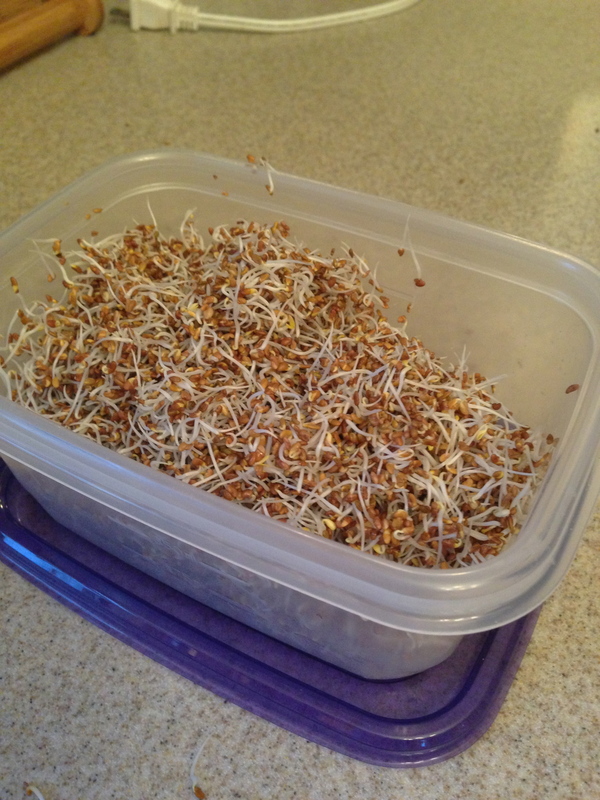 Drain and rinse the seeds 3x a day until sprouting is complete. You can leave them upside down and at an angle to allow for continuous draining. Keep the jars covered with a towel. I left my in our drying rack. The seeds only take a couple of days to sprout. Make sure not to use hot or warm water to rinse and keep an eye out of mold if the jars are kept in a warm area. Sprout are very nutritious and great in salads or on sandwiches. Making your own sprouts also save money! Categories: Homemade Goodies, Money $aving Ideas | Tags: Brussels sprout, home gardening, Plant, Salvia hispanica, Seed, Shopping, Spring cleaning, Sprouts | Permalink.